Help Iria discover what happened to her father. But careful, messing with the past sometimes can be painful. Using an old Super8 camera, Iria will be able to rewind or fast forward objects to modify her memories. Solve puzzles and hide from The Guardian in order to find the truth of Iria's past. Born as our Master's Degree Project, TAPE it's a demo version presented as contestant for the PlayStation Talents 2017 and winner of the Most Innovative Game at the PlayStation Awards Spain 2017. Inspired by games as SOMA or Silent Hill, TAPE wants to make you think, to be suspicious of everything and above all, tell you a story. This game is an alpha version of the game and does not represent the final quality of the game. Thanks for browsing our game! Since this project was designed for PlayStation 4, we recommend to play it with a PS Controller or similar. Iria's camera can start affecting objects if they're inside the Focus (the white circle in the middle). To keep affecting them you'll need to keep them inside the screen. An Story Item can't pass through other objects or Iria herself. All of Story Items will try to go back to their initial condition, unless you Rewind or Forward them completely. Iria's camera can be used to defend yourself. This project it's still on an Alpha stage and, since we are working on it, we'll love to see your gameplays and read your feedback. Also, the story it's presented in a vague way, and we'll develop it further in the future, but we'll love to hear your opinion about it. Sorry for the bugs and thanks for your time! Check out or new trailer! I LOVE this ! Highly recommend ! the camera/tape mechanism is so cool and unique ! way to go dude ! I seriously hope you ( Mr. Dev) is still developing the game ! Man I loved this mechanic. One of my Lovely lords suggested this game to me and now I can't wait for the finished product. I do Hope you are still working on it. Weird, I thought I had already commented directly on this page but I didn't lol I already sent you my praise on this game and its mechanics back when I played it so just posting this here to say again that you guys did a really great job and deserved the award. Good luck with everything in the new year! Great! We have just listened to your podcast but we didn't know that you had made a playthrough too! Thanks a lot! Really excited for the full game! Switching the doors in the projector room was my favorite part, because it changed my idea of how the camera worked. Thanks a lot for playing and enjoying TAPE :)! We are improving that part to be even more mindblowing, we hope the complete version of the game will meet exppectations... we are working hard in order to achieve it! If you want to know more about the development process, please follow us on Twitter (@blackchiligoat) ^^! We really recommend you SOMA, is a narrative horror experience with a really interesting story, that's why we love it! Thanks for the gameplay! You guys sincerly have something good going on here. I hope this becomes a full game one day and I would genueinly pay money to buy it. Wow! Thanks a lot for the compliments, they encourage us a lot! We are working hard on bringing TAPE to PS4 and Steam as soon as it is possible, so we hope the final game will like to you all! Yeah, we want to focus on atmosphere like the good old games like Silent Hill! We'll try to follow that mentality the whole game ^^. Thanks for the awesome gameplay! Me ha encantado el juego, va a seguir o eso es todo? for some reason it never changed? Had a great time! Love to see more. Heya! We are planning to release it on Steam as well during 2019, by now (and since none of us owns a Mac :/) will be only released on Windows but in case we can finally develop it for Mac we will announce it for sure! Heya Angelique! Actually we try to keep updated our Twitter account (@BlackChiliGoat), we're working really hard these months so we can release TAPE asap and we are looking forward to show you people more content, but for now we have nothing worth to show but we can asure that the project is in process. Thanks for the patience :D! Not that much scary no Jump scares but the game is good. Thank you very much for the video! 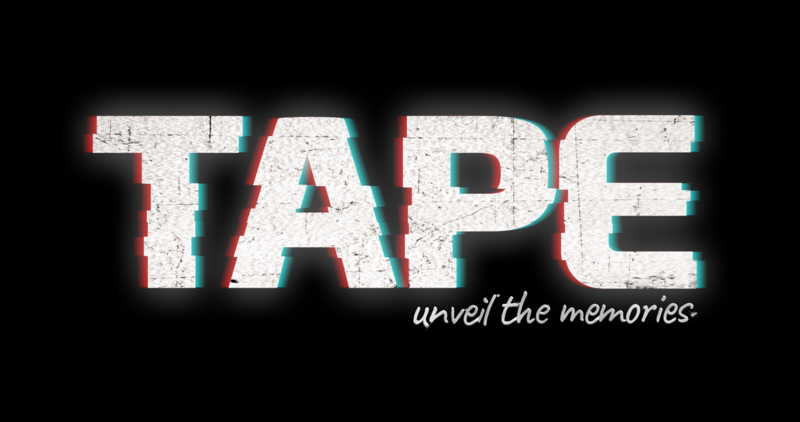 We're glad you enjoyed it :) Soon you will have news from #TAPE, follow us on Social networks :D! I posted this video a while ago but for anyone who finds it interesting and wants a taste before playing can check out my video, I highly recommend playing it and supporting BlackChiliGoat Studio!! Can't wait for the full game!! Thanks for your support! We are now developing a full game. Stay tuned! Oh sure, explain where to put the focusing thing in the description without also saying it in the game. That's helpful, considering I always forget to look at the description before starting a game. But sarcasm aside, I actually did enjoy this game once I figured everything out. I decided to follow you in case of further updates. Hahahaha it's one of the things we will improve for the next demo, it's a learning proces :D! Thanks for the follow and the gameplay, cheers :D! It was interesting and very enjoyable, would love to see more! Thank you for playing our demo and for the compliment we will work hard to bring you the complete game asap! Cheers and saludos! Great game with very interesting mechanics. Cant wait fro the full release! We expect to release it at the end of this year, we will work hard! Thanks for the demo Zeo! Hahaha it's a honor to remind of Layers of Fear, we love the atmosphere of that game! But we will work hard to make our own way! Great video! Hope to release it at the end of this year, we will keep you informed :D! Played the game, and gotta say I enjoyed it. Hoping to see more of it, and seeing whats on the other side of the bright light at the end! You do well! We hope the best to your channel! I tried it, and I loved it, was a great game, the story was nice, and had some horror aspects. Or Thriller. But I like how it turned out! and I would like to see more on this game! We hope we can bring news about the game soon! Thanks for playing our game :D! Hahaha, so this week we are back in development! So during the next months we hope we will have good news to share, meanwhile... we will be updating the development on our twitter account :D! Cheers and happy new year! This game was fantastic. I loved the camera mechanic! Looking forward to more!! The rewind and fast forward mechanic of this game was very interesting and very well done! I loved the demo so much and it left me wanting so much more. Cant wait to see more if its coming! We hope we can bring the game soon to let you unravel the mystery! Great gameplay! I was able to finish your game. It was a camcorder so I can accept that :) very good game this will make a nice addition to the new 2018 playlists. I look forward to seeing the rest if more is going to be developed, if its on Gamejolt I will support it there too. 5/5. Wow we will put it on Gamejolt soon too! We didn't think about at all =_=! This is a great demo! I had loads of fun playing it! I love the unique us of the camera mechanics. And this was a great video! Thanks for enjoying it, we will work on improve and take advantage of all the mechanics :D! I played your game its quite fun and unique! :) Keen to see where it goes! Keep it up! Heya Rezquot! All the "voices from the other side" you were making were quite creepy, we loved them :D! Sorry if you were expecting more jumpscares, we are working on making the final version way creepier. Dude omg :D This is actually great! I genuinely hope you guys succeed and bring more to the table for this game! I hate tapes...even in a horror game, something about them. crazy theory about the story... the mom died and the dad killed her ? insanely good game guys absolutely enjoyed it:D any info on the full release? Well, not close but you are on the right way hahaha! I love the camera mechanics! The concept is amazing! I wish there was more to play and more puzzles to solve! Had an amazing time playing this one! Oh we love this kind of good vibed comments :D! We will work as much as possible to release a game with plenty of interesting mechanics and creepier atmosphere :D! Thanks a lot for the gameplay! Cheers! Jajajaja, muchas gracias! Nosotros también esperamos con ansias traeros el juego completo y que lo disfrutéis :D!